I am sad that Senator Ted Kennedy is dead. I hate to say it, but it made me feel a little more at ease, having someone with a stitch of knowledge, amongst all the idiots in the Senate. I know he was called a Liberal...and in many circles that's a four letter word. But he was a tireless advocate for the people of this country. Sure, when he was young he was an idiot. He was wealthy, and entitled, and made mistakes..imagine that. But the poor guy paid for those sins a hundred times over. Tragedy was at his doorstep every year. He gave his time to the people. And he did it whether or not it was popular. He fought his entire life for the rights of the handicapped and mentally ill by passing laws that prohibited discrimination in the workplace. He fought for minorities, passing immigration laws that let people in to this country based on merit, rather than race. He fought to give women equal treatment in school athletics with Title IX. He fought to keep us from going to war, when we should not have. He fought to give Ireland freedom. He fought to give young adults the right to vote, changing the voting age from 21 to 18. He fought to make it affordable to heat your home if you were poor. He fought to give education to preschoolers in poverty, with the Head start program. He fought to give health care to every American, and we are almost there thank god. His legacy is truly one of compassion for all. No wonder my fellow Bostonians loved him so. There's no lion you'd rather have on your side. So, even though he was old...you still wanted him around. He just knew so much, how to accomplish so much. He should have had another twenty years. We mourn our loss as a country. What a heartfelt and wonderful tribute, Ashely. Very poignant. 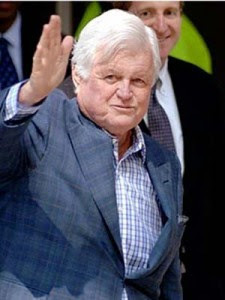 RIP Ted Kennedy.